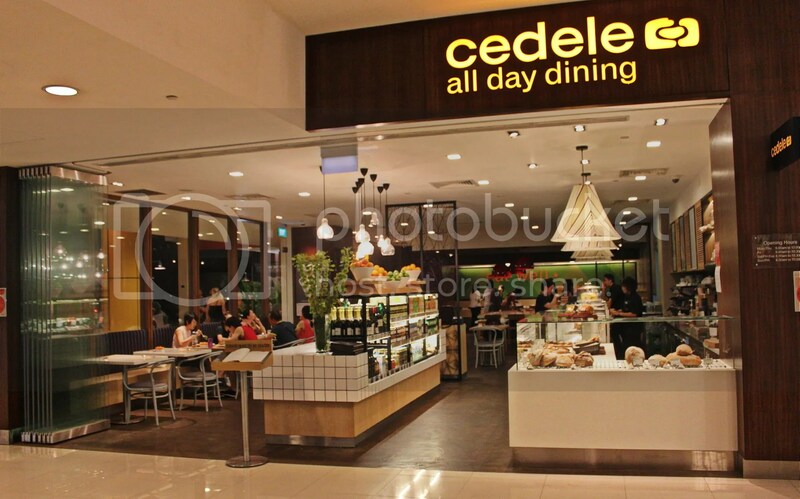 When I think of Cedele, what comes to mind is the relatively healthy sandwiches and the carrot cake but it seems that such is just the tip of the iceberg and applies only to their bakery cafes. There are quite a number of other outlets that do all-day dining (Great World, Wheelock Place, Raffles City) and semi-dining (Rail Mall, Parkway Parade, Serangoon Gardens, Marina Bay Link Mall to be open soon, Greenwich V) as well , where an impressive array of hot mains are available. The Company’s philosophy of “Eat Well, Be Well” drives Cedele’s operations and is evident with their stand on using organic unrefined sugar, grapeseed oil and ingredients with no trans fat. In addition, much emphasis is also placed on making food with ingredients that are as natural as possible (which I guess is also a healthier option), so no preservatives, emulsifiers or premixes are used in their kitchen. Running slightly late for this tasting, I had the Apple Cranberry Cinnamon Lassi ($6.70) to cool myself down. Organic yoghurt was used to create the lassi, which was slightly lighter as compared to its Indian counterparts. 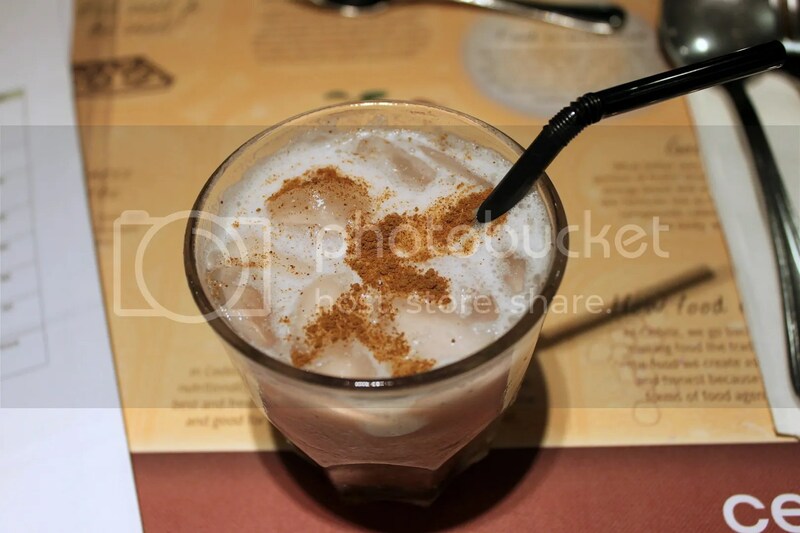 Didn’t take to the cinnamon though, as it made the drink too powdery such that it didn’t go down my throat smoothly. Moreover, the liberal use of cinnamon musked the apple and cranberry. 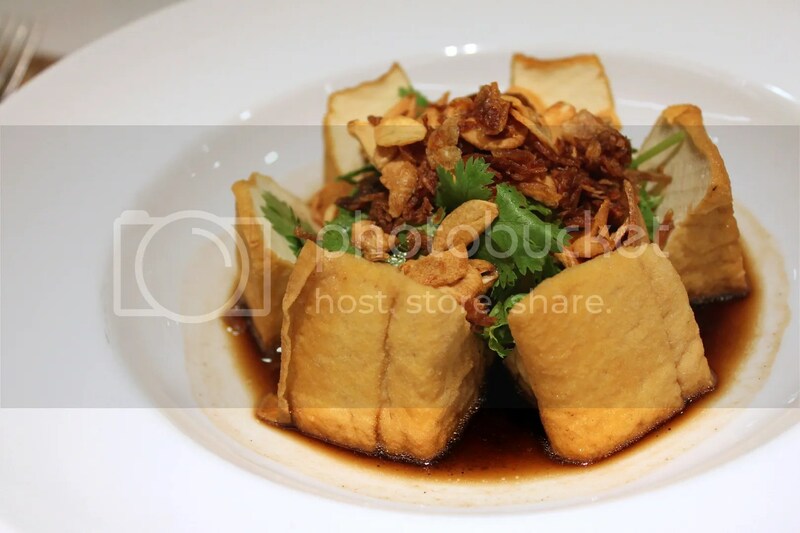 Nothing too fancy about the Burmese Shan Tofu ($8.90). It was more or less a simple tau kwa (豆干) dish in Balsamic Dressing garnished with homemade Garlic & Onion Flakes and Fresh Coriander leaves. What I did like though was the garlic and onions, which tasted freshly fried. 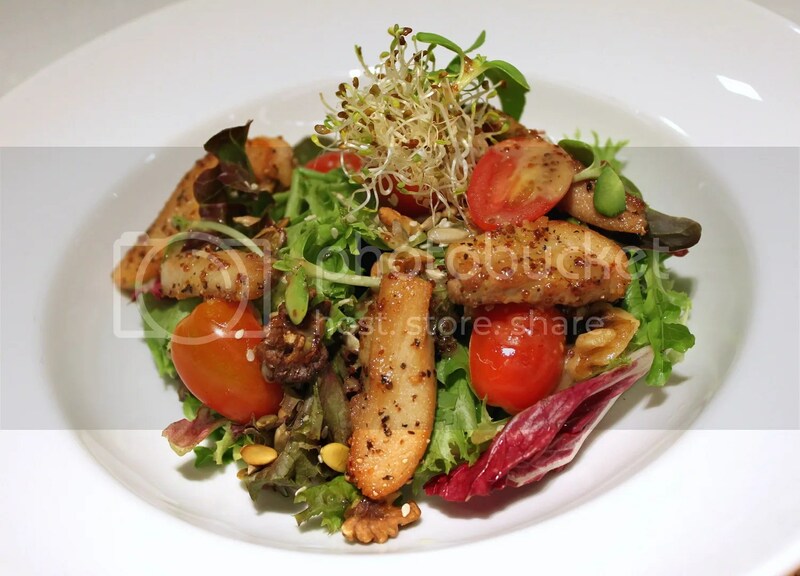 For those on a low carb diet, you might want to consider their Grills & Greens Salad Meal: Chicken & Walnut ($15). 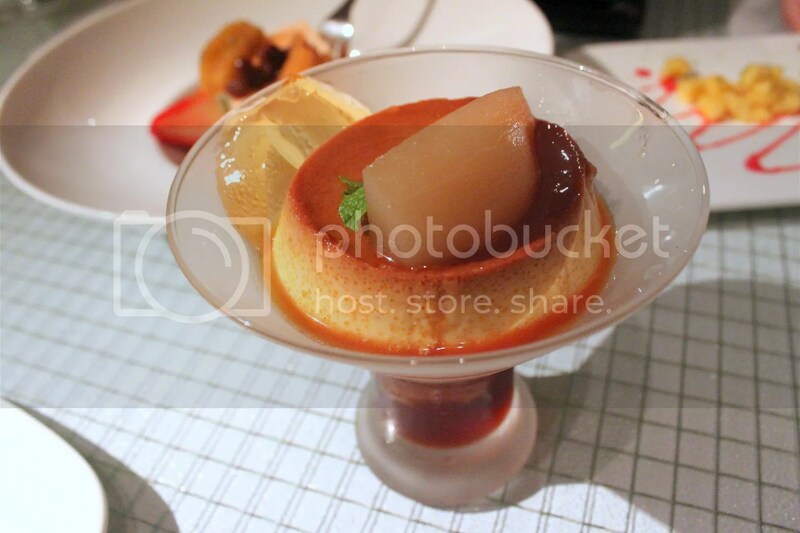 Different dressing are available such as the Sesame with Plum which coincidentally tastes very much like the plum sauce used for yu sheng (鱼生), the Honey Mustard and the Caesar Dressing. My favourite would be the Caesar. Might be my mind playing tricks on me but their Caesar dressing tasted a lot less unhealthy then what I’m more used to having. Not complaining though, I did eat a KFC Double Down Max with an accompanying piece of Chicken for lunch. 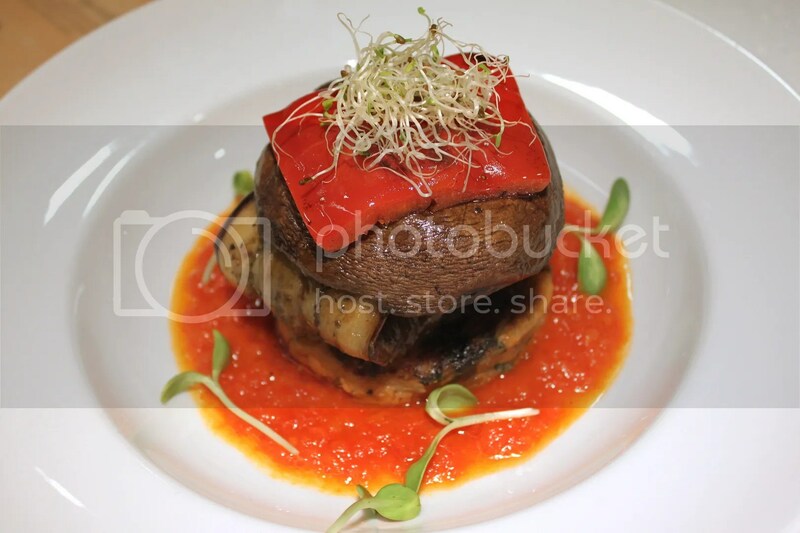 The Vegetable Stacks ($18) was made by stacking a Potato Kumara Cake (a type of Sweet Potato from New Zealand) at the base, followed by a Grilled Eggplant, a Portobello Mushroom and Red Pepper, which is then surrounded by a moat of Tomato Coulis scented with Marjoram. 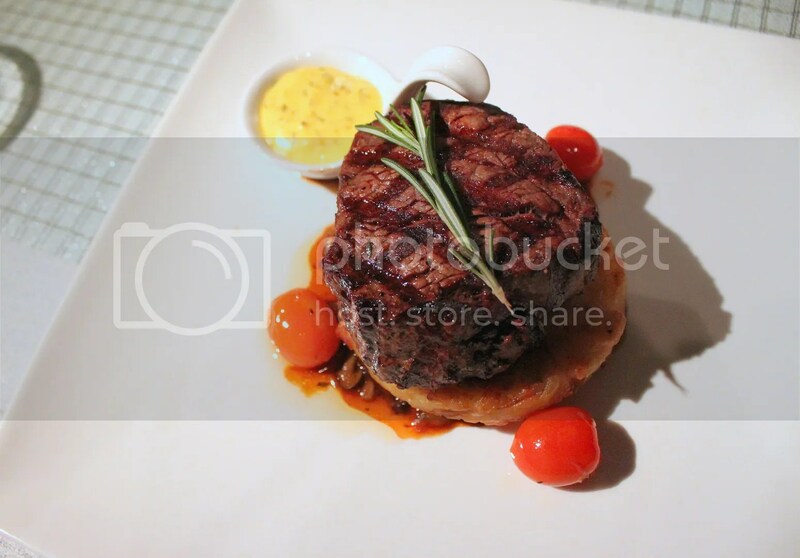 Credits have to go to the Tomato Coulis, as it complemented the vegetables really well and was not overly tart. 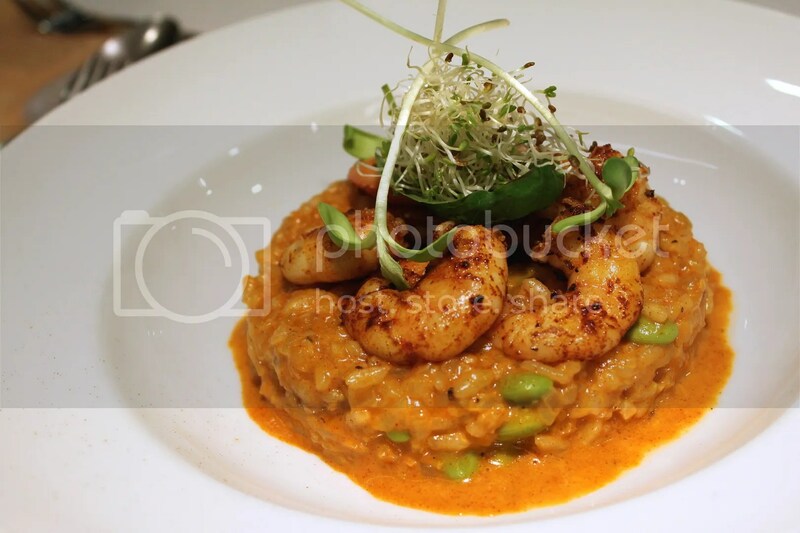 Unlike some restaurants which soak their prawns in sugar or salt solutions to give their prawns a nice springy texture, I was given assurance that nothing of the sort was practiced here for the Prawn Paprika Risotto ($17.90), so the fresh crunchy texture I experienced from the prawns was the real deal. To give the risotto a healthy twist, pumpkin and edamame beans were also used as ingredients and it all turned out well. 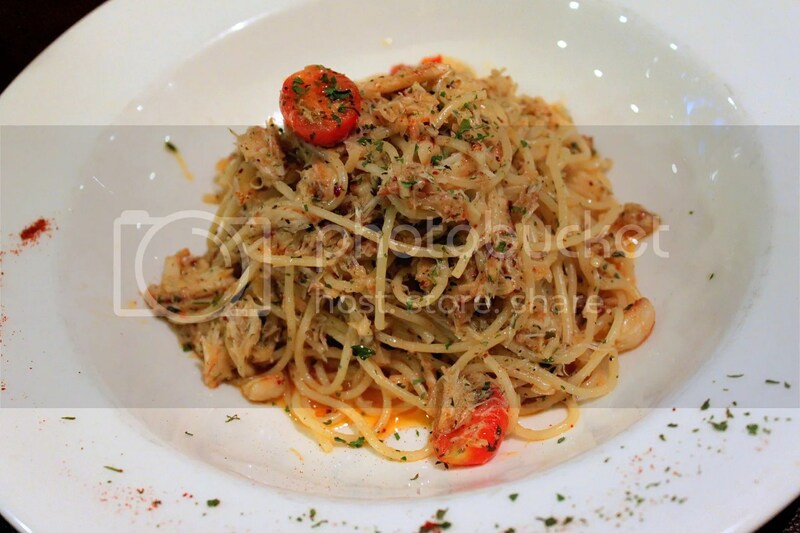 Finally, something somewhat less healthy for a change, the the Black Pepper Crab Pasta ($17.50)! I like Fried Soft Shell Crabs in general. The one I had here was not as crispy as expected though. That aside, I really loved Pasta, which was scented with Curry Leaves and Pepper. It packs enough heat to make one reminisce the last black pepper crab dinner without being overly choking. 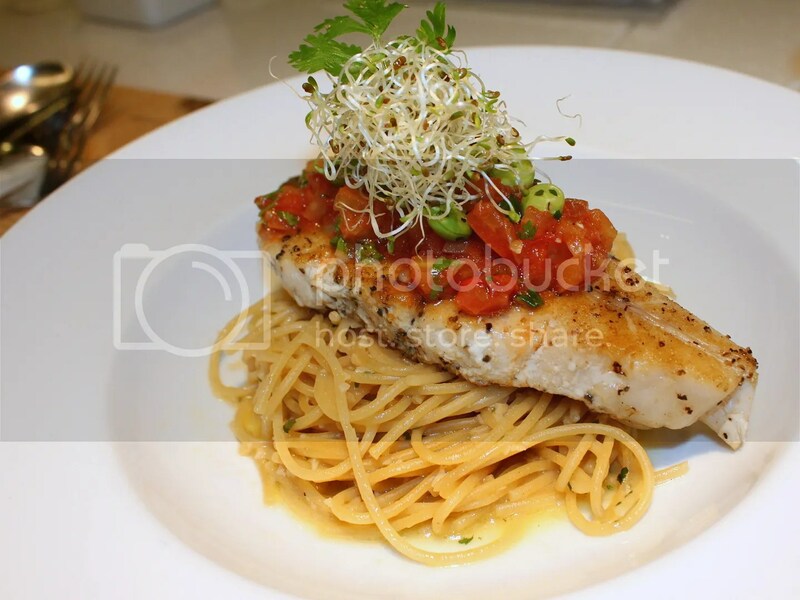 The Lemongrass & Lime Fish Pasta ($17.90) was a nice sequel to the crab pasta. I thought that the lemongrass and lime was titillatingly tangy enough to placate the spice. 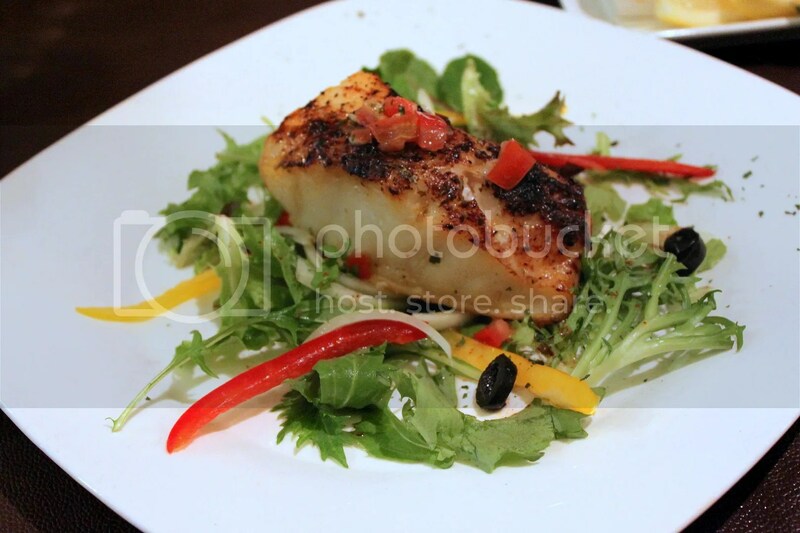 I’m not a fan of Sea Bass because it tends to get too lean and dry for my liking upon grilling. Apart from the extremely generous size of the fillet, there was nothing extraordinary about the Grilled Sea Bass but it did give off vibes of home-cooked food with the healthy toppings of tomato salsa and edamame beans. I have to say that desserts were the climax of the meal. I was given a tasting portion of 7 cakes, of which the salted caramel isn’t shown below. My favourite would undoubtedly be the Black Sesame Tahini Cake. It had a very light texture but oh so rich. I literally had a little tingle when I popped the first piece into my mouth. Utterly heavenly. Other flavours I would recommend as well are the Red Velvet, Carrot Walnut Cake and Blueberry Hazelnut Cheesecake while skippable flavours would be the Chocolate Banana Espresso Cake, Strawberry Rose Cake and Salted Caramel (not shown below). This meal was sponsored by Cedele. Special thanks for the invitation. 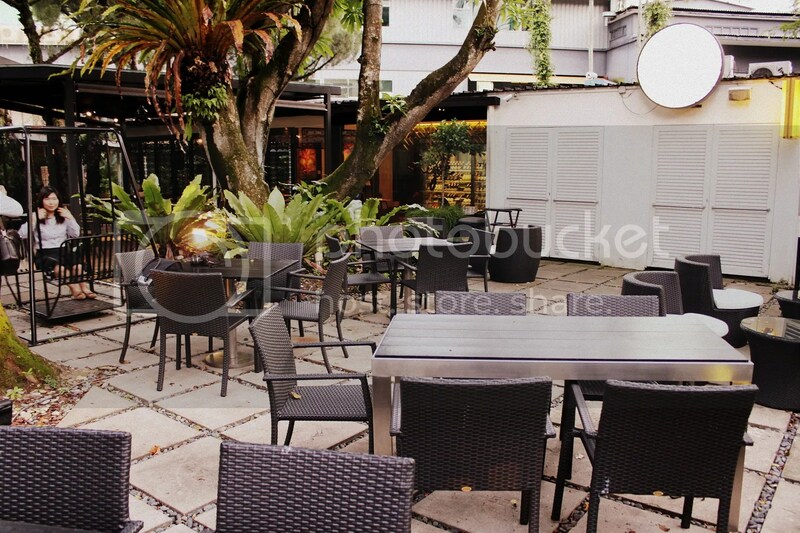 Categories : All YumYums in my TumTum, Clarke Quay, Cuisine Type YumYums, Desserts, Invited Tasting, Location of YumYum, Tanjong Pagar / Outram, Vegetarian, Western, Yummy! This is going to be a really long review as it will combine a review of their 2-week old new menu, in addition to snippets of their former menu (back when I dined there in March’13 for my 24th birthday). I have been a fan of Owner/Chef Vincent Teng since his days at Table 66, where I was officially introduced to sous vide style cooking. I still remember the lamb shank I had back in June 2010, which felt like butter as my fork pierced through it. 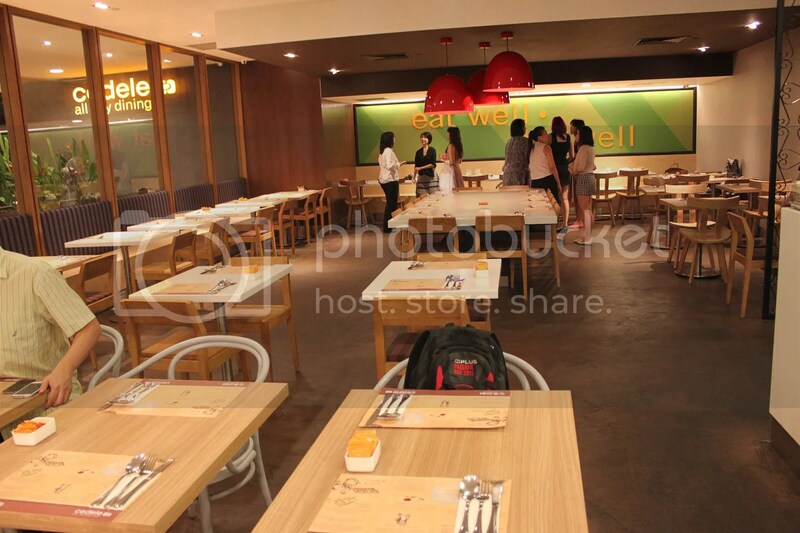 Table 66 has since ceased operations but in its place, Chef Vincent has reincarnated his cooking concept within a more casual and light-hearted environment that many fondly now know of as Skyve (an apt name to emphasize the shift towards casual dining). 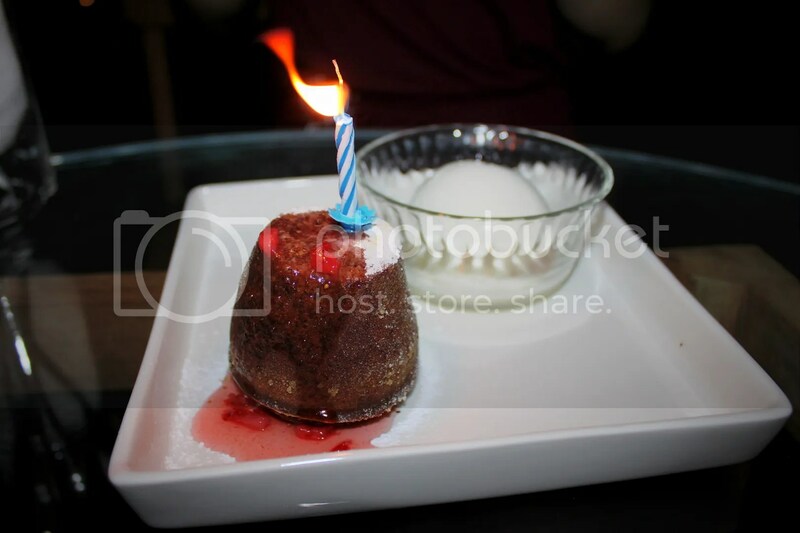 Prior to this review (covering 2 of my dinner visits), I had been to Skyve only once for brunch. That was when R and myself still had the luxury of time to indulge in regular weekend Sunday brunches. Apart from the more pricey brunch menu, there’s an ongoing $6 nett breakfast promotion set (Toast, 2 Eggs, Sausage, Ham & Baked Beans) which is available between 10am-11.30am on weekdays too. That’s about the same price as a Mcdonald’s Breakfast, how awesome is that! 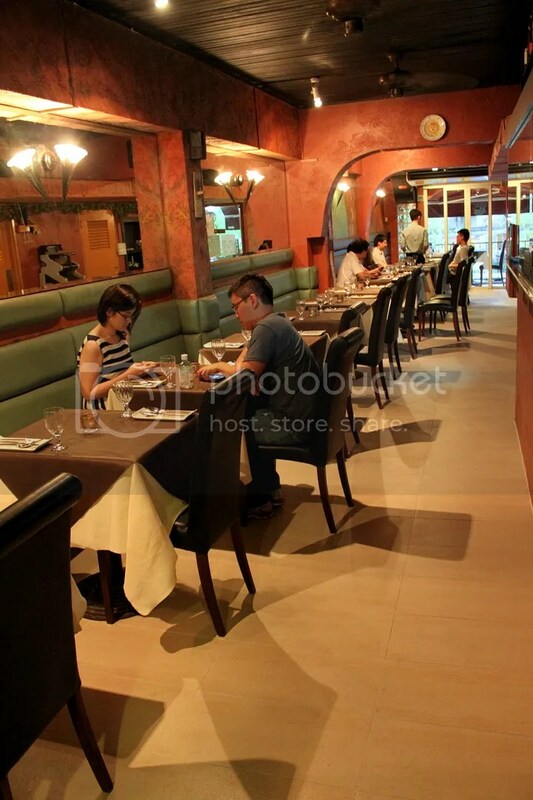 There are 3 separate areas to the restaurant, which are the al fresco section (probably more for brunches), the restaurant section (for lunches and dinners in the comfort of aircon) and the lounge area (for light bites and booze). 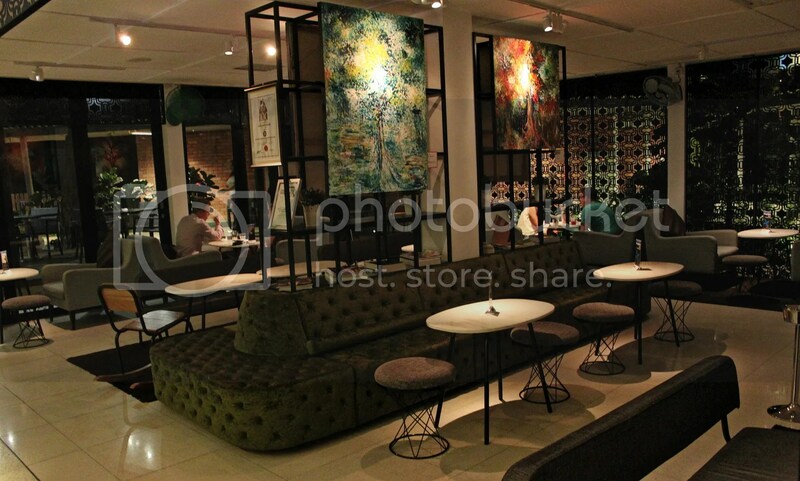 The lounge area in particular is really intimate and a perfect place to relax after work, knocking back a glass of wine while indulging in half a dozen oysters. Instead of having the mindset of “Why fix something that isn’t broken?”, Chef Vincent decided that it was time for a facelift of Skyve’s menu. While feeling a bit sad to see some really commendable items ceasing to exist, I was simultaneously rather eager to see what new creations were being introduced next. We commenced the tasting with the a sampler of raw oysters, prepared in various styles. Of the lot, the one with the most distinctive taste was the ‘Escargot’ Style Oyster, which was gratinated in nori butter and topped with shaved bonito flakes and toasted sesame seeds. In my mind, while the taste is quite similar to an escargot, this definitely trumped a regular escargot by virtue of the desirable soft fleshy texture absent from a cooked snail. Truth be told, apart from aesthetics, there wasn’t much separating the Compressed Watermelon Oyster (topped with diced compressed watermelon, pickled watermelon rind and extra virgin olive oil) from the Lychee ‘Saketini’ Granita Oyster (topped with lychee & sake sorbet, seaweed “caviar”), as the natural creamy taste of the fresh oysters came across as most evident. 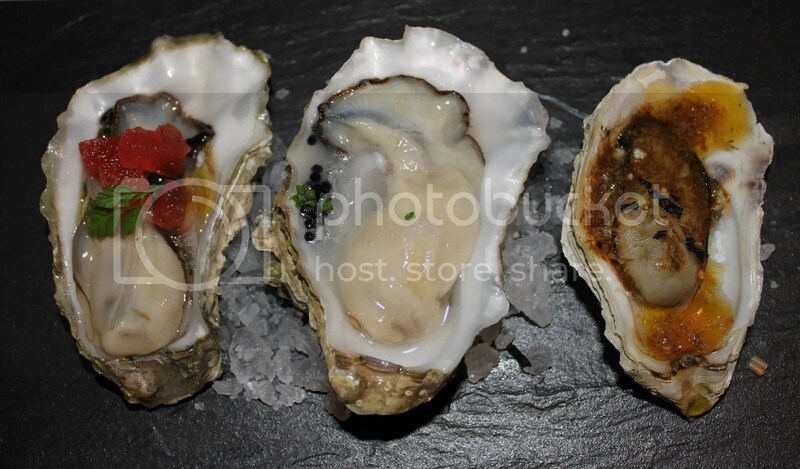 Oysters of a single style are priced at $34++ for 1/2 dozen, or $38++ if you desire a mix of styles. 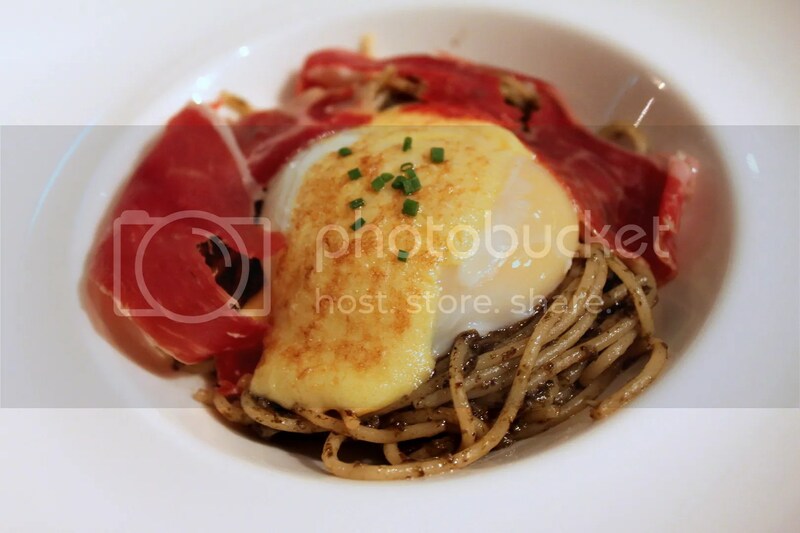 Another signature from Skyve’s new menu would be the Sous Vide Egg & Spaghettini ($18++). It was definitely tasty but also came across as slightly heavy for an appetizer, especially with so many flavors like the truffle salsa, iberico ham, hollandaise sauce and egg yolk all vying for attention. I must admit though, that if a sous vide egg could be labelled as a poached egg, it would probably have been the best poached egg I have had so far. 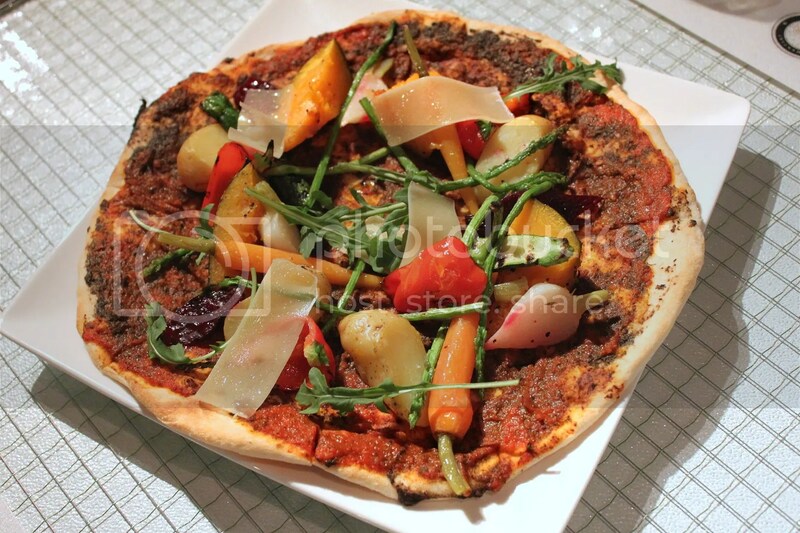 The thin crust Vegetarian Pizza ($34++) was garnished with pumpkin, carrots, potatoes, radish, all prepared in sous vide style, with grilled asparagus & capsicums, arugula leaves, truffle salsa and shaved parmesan cheese. Sous vide style involves cooking the vegetables (or meats) under relatively low temperatures in a vacuum under prolonged periods of time. Relative to simply boiling the vegetables, sous vide expands the time frame where the vegetables are cooked to a proper doneness, allowing the chef to get the texture and consistency right almost 100% of the time. In addition, the natural sweet flavors of the vegetables are less likely to be leeched out as well since it is cooked in a sealed vacuum bag, allowing for a more intense and concentrated flavor. That said, I would still prefer a pizza smothered in cheese with loads of seafood and meat. The duck confit was one of my favourite dishes the last time I was here so I was so looking forward to the reworked version. 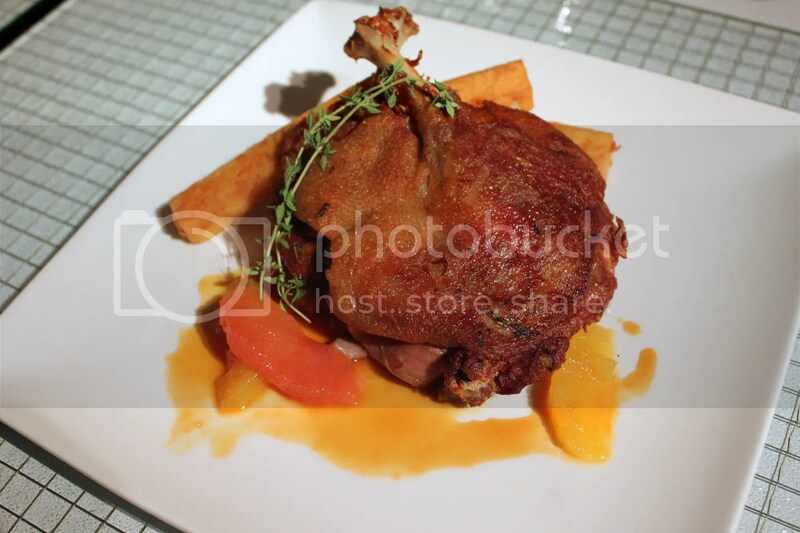 The Asian Inspired Confit of Duck Leg ($36++) was done sous vide style and marinated in Asian five spice, served with pickled fennel and orange segment salad, polenta fries & orange sauce. The first thing that drew my attention to this dish was the robust aroma from the five spice marinade, which engulfed the entire restaurant. 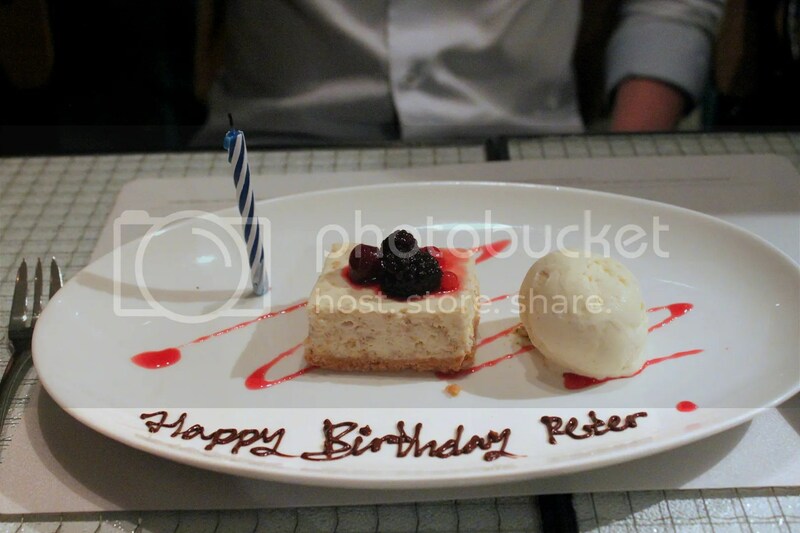 I’m sure it must have drawn some jealous looks from other diners who didn’t order it. Taste and texture-wise, it was also close to perfect in my view, especially the savoury crisp duck skin. 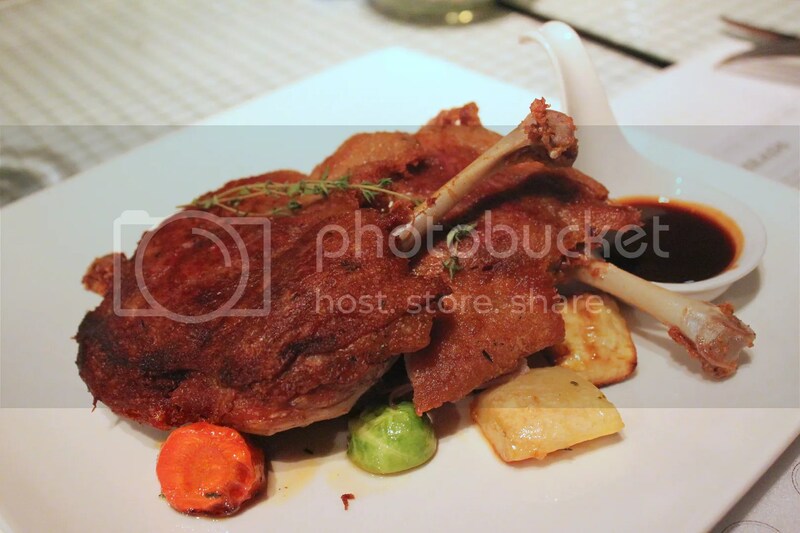 Another plus point is that Skyve doesn’t scrimp on its portions and 2 duck legs are served per order. Downsides to this dish were that the Orange sauce didn’t quite complement the duck and I took to eating the duck in its unadulterated form, and while the polenta fries was novel with an internal texture similar to cous cous, I would have preferred just regular fries. 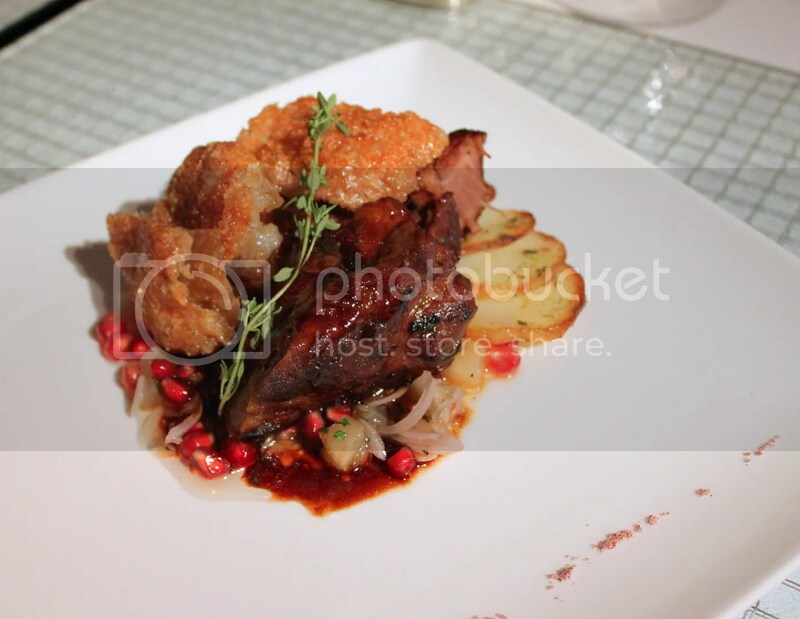 It was difficult to decide which was better, the duck or the Sous Vide Pork Shoulder ($36++) that had been braised in root beer and spice and served with savoury crackling skin, pineapple and pomegranate salsa, toragashi pepper & plum salt. 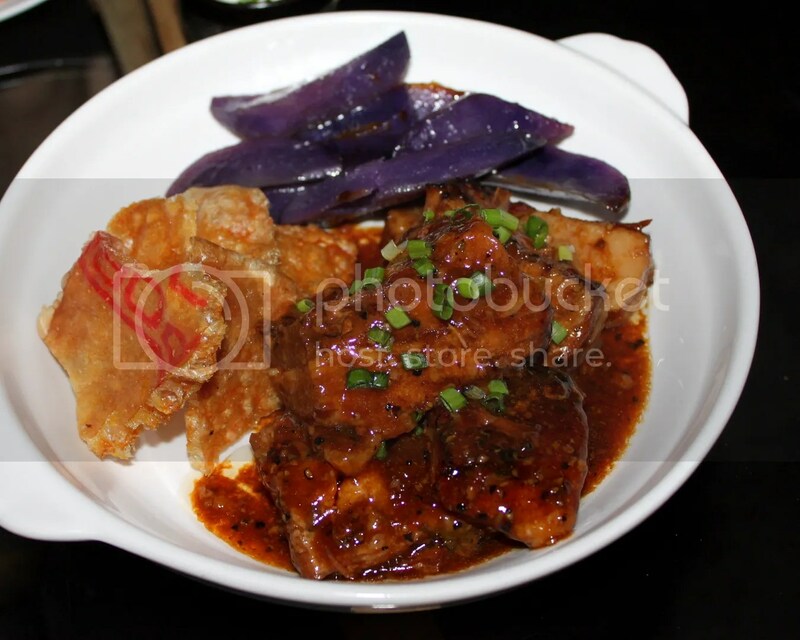 The texture of the pork was really tender, similar to a well-executed Cantonese braised pork dish. It was also hugged by a sweet glaze and thoroughly marinated with the root beer whose flavor comes as a light aftertaste. I didn’t have much issues with the crackling but one of the other diners I was with felt that it was a little dry. 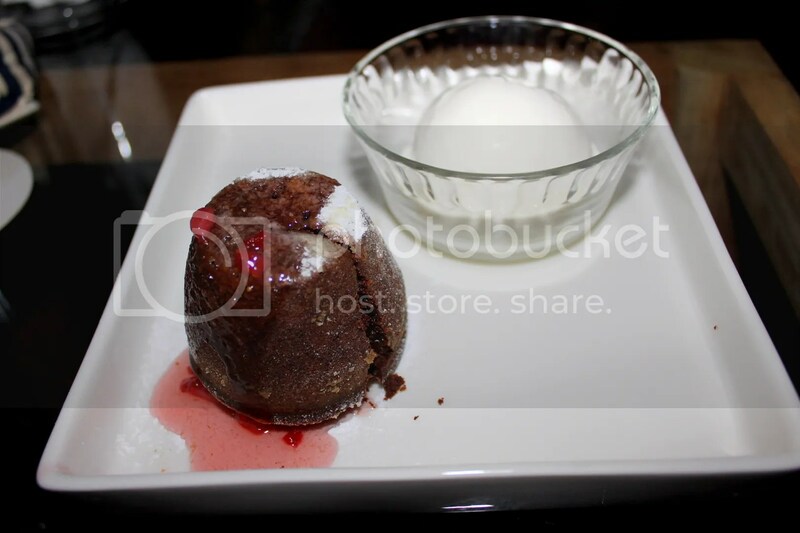 The Callebaut Warm Chocolate Molten Cake ($14++) was nicely done. They got the timing down right so the cake benefited from a lovely viscous core of warm chocolate. Funnily enough, the maple walnut gelato reminded me of po chai pills (保济丸) used for diarrhea relief because of an initial deep pungent taste from the maple. 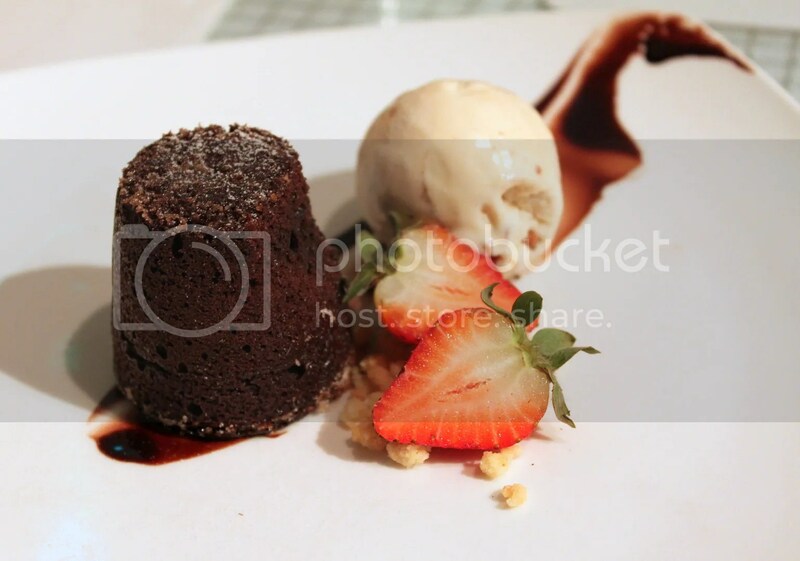 The other diners only drew this association after I mentioned it and had all found ice cream amazing initially. They reasoned that my sense of taste was acute because of food blogging but the real reason was because I choked on a fish bone and swallowed a whole mentos before, which resulted in my fear of swallowing tablets in general. So when I was in primary school, I had a case of diarrhea and chewed on po chai pills. The taste was so repulsive I vomited after and the taste of po chai pills has been etched into memory since then. 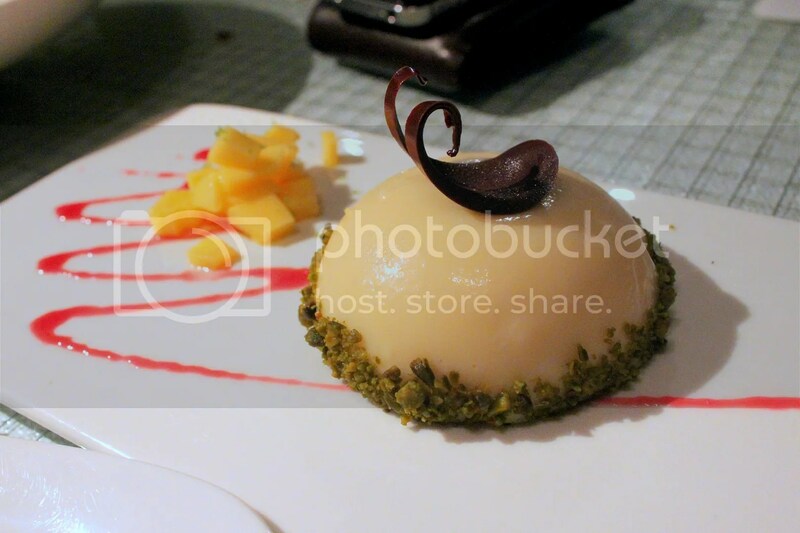 My favourite dessert was the Mango & Cheese Semifreddo ($12++). Think of a semifreddo as a creamier, more mousse-like version of ice cream. 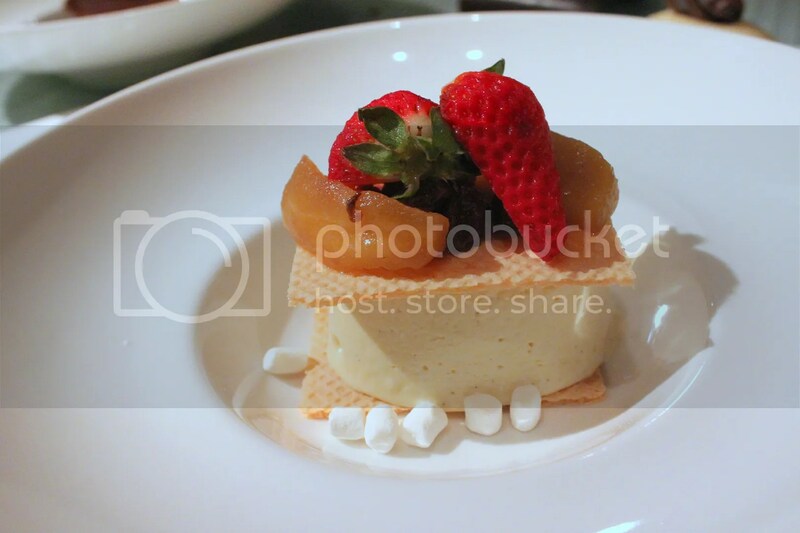 This one was really delectable, tasting much like cheesecake ice cream. The frozen lime foam perched on the semifreddo did well to balance the creaminess, thus avoiding running the risk of an over-cloying dessert. 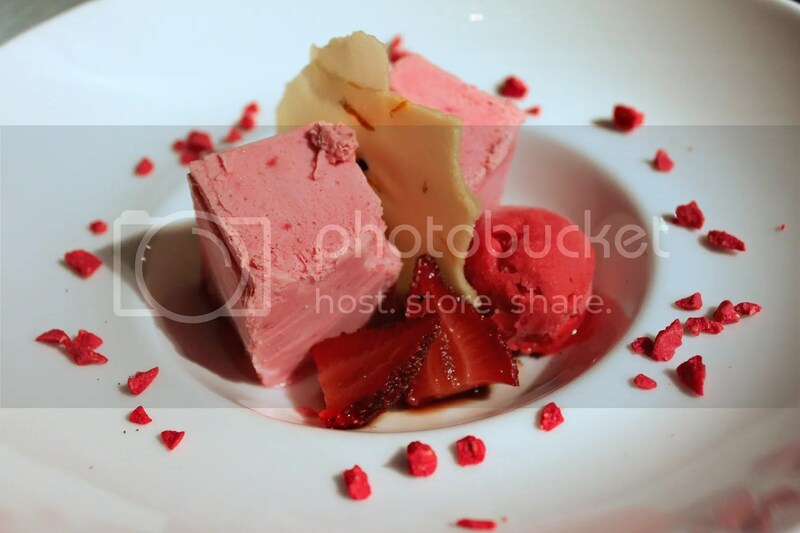 Another dessert I would recommend would be Inspired By Reds ($12++), a strawberry parfait with sous vide strawberry in balsamic vinegar, raspberry sorbet, flower tuile and dehydrated raspberry. 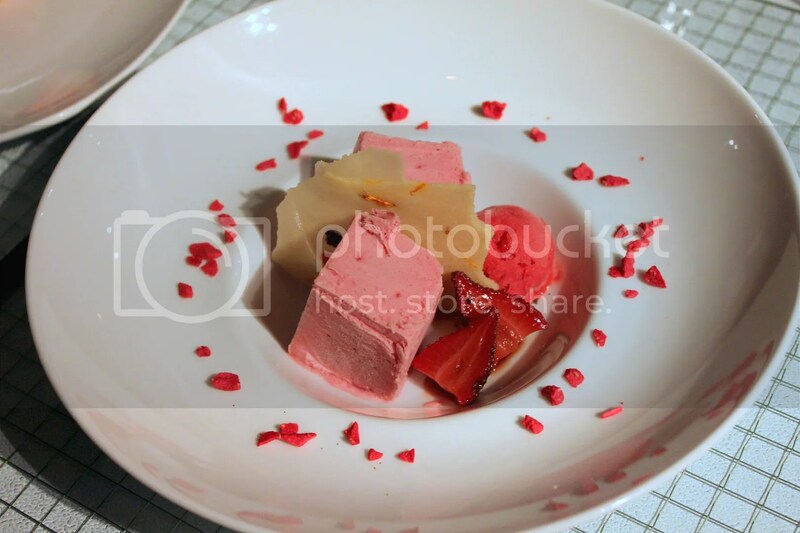 Highlights of this dish would be the smooth and balanced strawberry parfait, and the dehydrated raspberry bits which tasted like little bits of sweets with a concentrated sour zing. Apart from being visually stunning, this was also the perfect palate cleanser. I abhorred the Tiramisu ($12++) becuase of its over-soggy nature but this view wasn’t shared by everyone, as almost all the lady diners present adored it precisely for that same point. One even went further to say that she preferred it soggier. Only today did I realize the vast misalignment in what different individuals would consider a good tiramisu. The dinner was an invited media tasting and paid for by Skyve. Special thanks to Shasha from FoodNews for hosting the evening. I enjoyed myself tremendously! I was desperately thinking for a place to celebrate my birthday dinner, somewhere that had good food and ambience, wasn’t too obscure for people taking public transport, not too extravagant nor too crowded for a Saturday night. Such a selective filtering procedure lead me to shortlist Skyve. For my appetizer for this dinner, I had the Seared Foie Gras ($22++), which was actually quite value for money in my book. 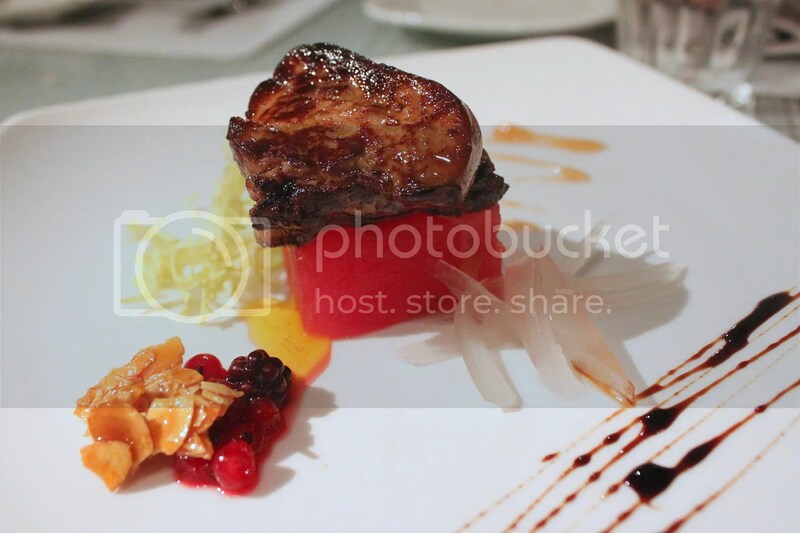 Saveur fans might start hurling rocks at me saying that Saveur does it for $8 but I reason that the seared foie gras here is thicker, more fatty and tasty. And once you adjust for the size/weight of the foie gras (there’s actually 2 pieces of stacked foie gras in the picture), it all work out. The compressed watermelon, macerated watermelon rind, caramelized almonds, ume compote were pretty much useless adornments though and didn’t contribute much to complementing the foie gras. I ended up eating the foie gras and the watermelon separately. 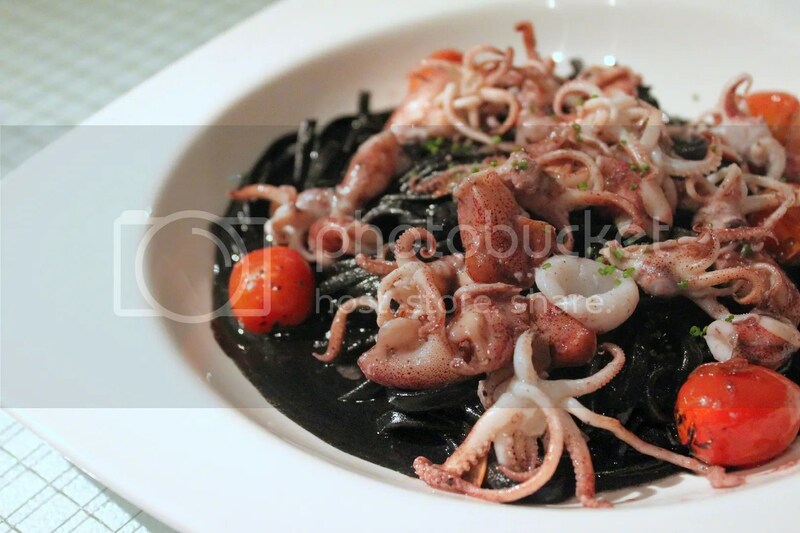 The Squid Ink Spaghetti ($30++) was also really tasty. While this might potentially be one of the biggest no nos to order on a first date, trust me when I say the one here is worth the risk. 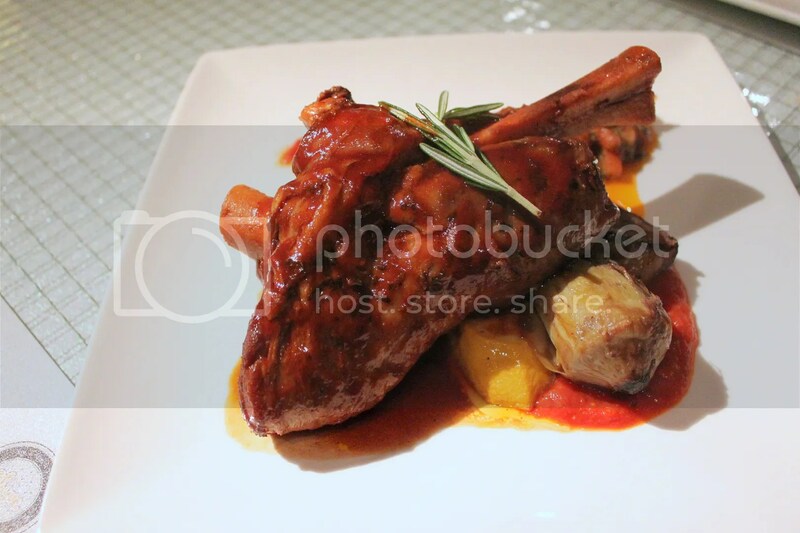 The Lamb Shank ($32++) braised in Red Wine wasn’t as tender as the one I had in June 2010 but still good nonetheless. Despite being a recommendation by the staff, the Grilled Beef Chateaubriand ($40++) was quite a let down as it was rather lean and tough. There was some redemption from the Potato Rosti, Wild Mushrooms in Veal Jus Reduction and the accompanying Bearnaise Sauce, which added some flavour to the otherwise rubbery steak. The Sous Vide Crispy Pork Belly ($34++) was a winner. I would say it’s better than the one at Ember, just because the sous vide cooking made the meat incredibly tender. I was sincerely shocked when my fork delved straight into the pork with almost no resistance. It was so jaw dropping and unbelievable that I had to ask my best friend K to poke at my pork as well. It’s just not something you’d encounter everyday. The problem I often encounter with Crackling Skin is that it’s so darn hard to cut it, especially if it gets soggy or overcooked. The crispy crackling here however, broke apart relatively easily to my relief. Tastewise, I think the pork belly was perfect on its own without the prune sauce, which tasted surprisingly savoury rather than sweet (like a mild Hoisin sauce). While I wasn’t a big a fan of the Potato & Apple Gratin and Fennel Salad with Mustard Seed on the side, it does help to cleanse the palate from the unctuousness accruing from the pork. 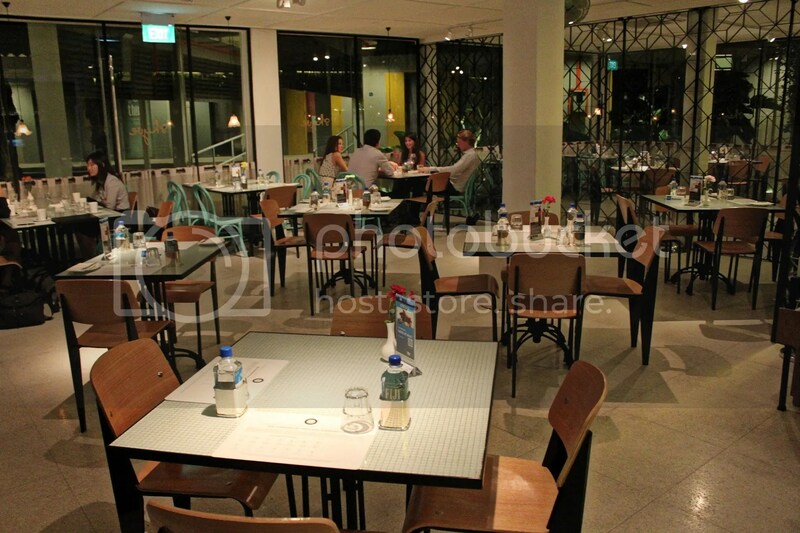 Let’s just put it this way, Skyve is currently within my top 5 favourite restaurants in Singapore. It’s a great place to find out more about sous vide style cooking without busting your budget…much. 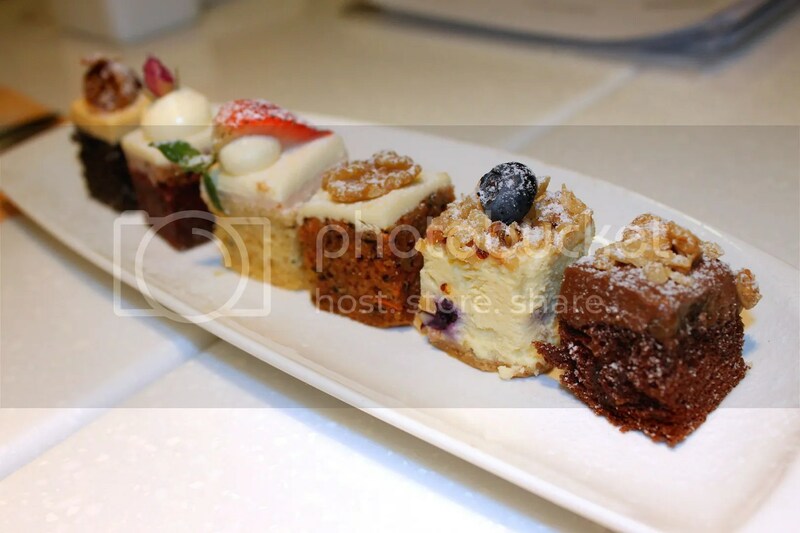 Categories : All YumYums in my TumTum, Cuisine Type YumYums, Desserts, Fusion, Invited Tasting, LEGEN...wait for it..DARY!, Location of YumYum, Novena / Newton, Western, Yummy! Standing proud at a discreet corner of Holland Village is old dame Amici. She has been around for 13 years and counting, entrenching her status as a veteran in Italian cuisine. 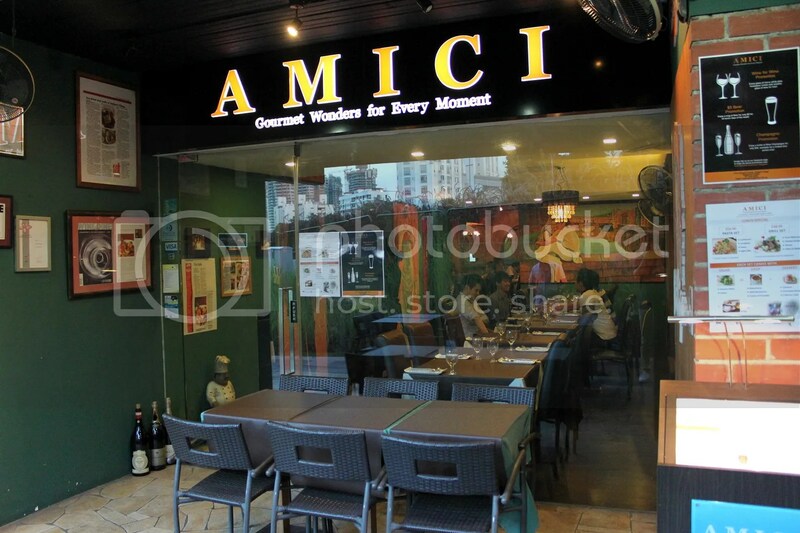 Amici means “friends” in Italian and how apt it is as I personally find it to be an ideal place for long undisrupted catch up sessions in the hustle and bustle of Holland V. Meals at Amici exhibit a stark contrast compared to other popular spots in the vicinity such as Crystal Jade La Mian Xiao Long Bao (which does an affordable steamboat and XLB buffet) and Everything With Fries, as meals here feel a lot less hurried, contributed partially by the cosy, rustic and rather quiet interior of the restaurant. On the other hand, sad to say that much of their food didn’t impress. 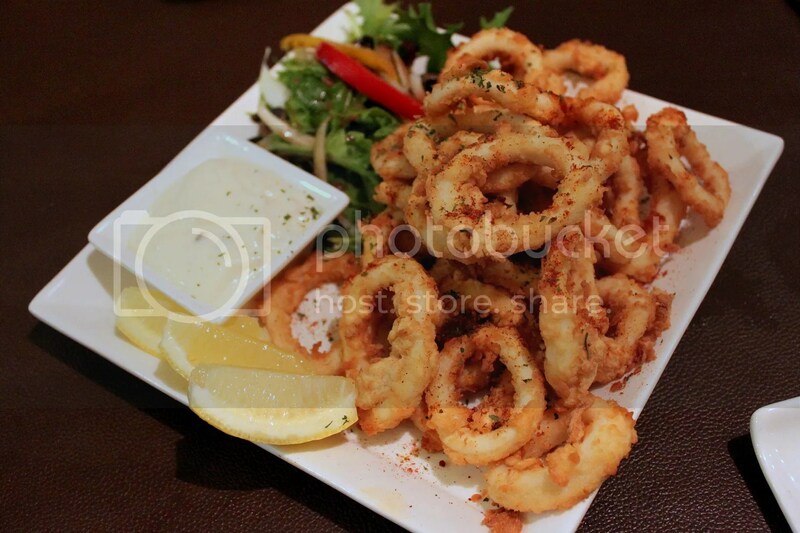 We started off dinner with the Deep Fried Calamari ($13.90++/small or $19.90++/large). As with Amici’s rendition, I too like my calamari on the tender delicate side, where a light batter is used and chewing is made minimal. A creamy aioli dip on the side undoubtedly enhanced the palatability of the dish. 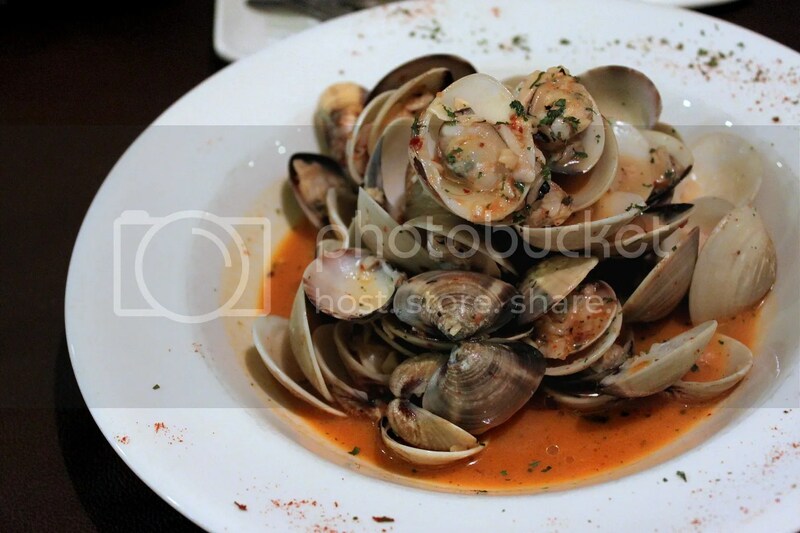 Next came the Saute Vongole ($17.90++) aka clams served with white wine sauce and chili. While similar in taste to the steamed lalas’ in spicy sauce one can easily find in Chinese Seafood restaurants or in an East Coast Park hawker stall, the vongole at Amici differs slightly as the spiciness level of the gravy has been toned down a notch, so that diners get a greater sense of the natural bittersweet flavor from the clams. 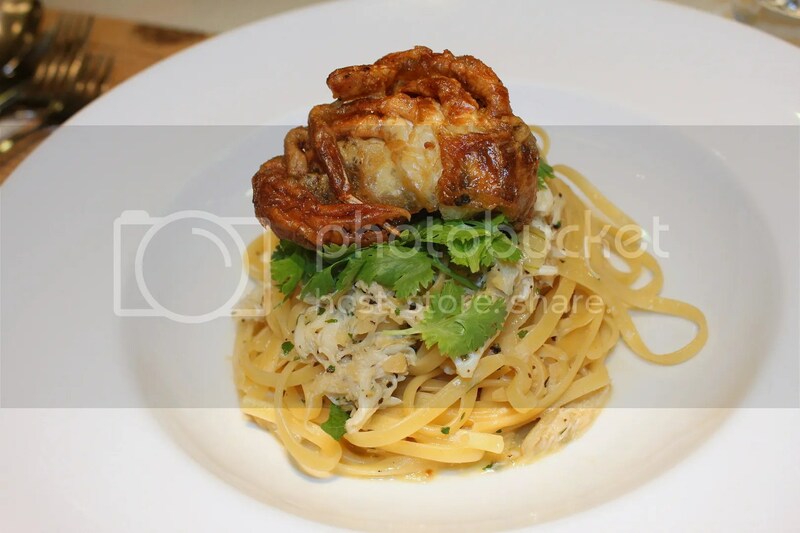 The undisputed best dish for the night was the Crabmeat pasta with garlic, olive oil & chilli ($27.90++). Cooked to a lovely al dente, the amalgam of flavours exuded by the briny crabmeat, oil and spice left me hankering for more. 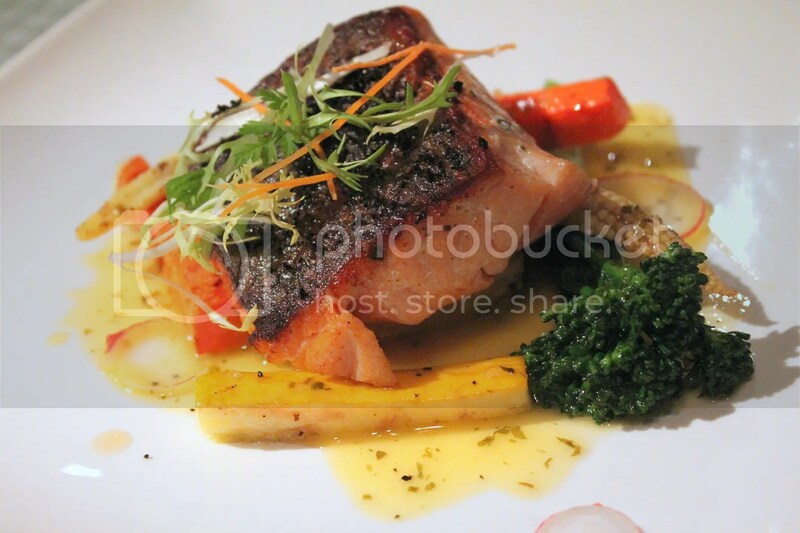 The Oven-baked black cod fillet crusted with butter Herbs and garden greens ($36.90++) was pleasant but unexciting and easily forgettable. Amongst the 4 cheeses (Gorgonzola, Buffalo Mozzarella, Scamorza and Ricotta) in the Pizza 4 Formaggi ($26.90++) aka 4 Cheese Pizza, what resounds most distinctly was the Gorgonzola, a type of Blue Cheese. 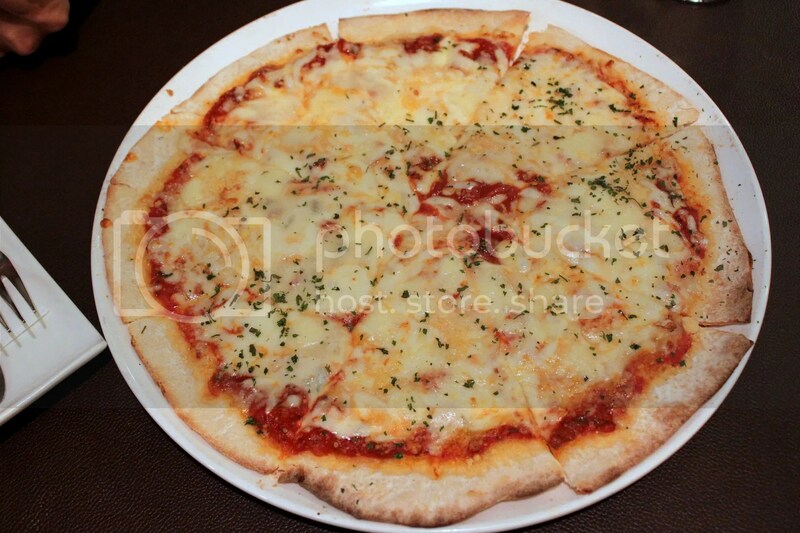 However, compared to some other 4 Cheese Pizzas I have had, this one comes across as relatively mild. I wouldn’t consider pizzas to be Amici’s strong point given that the thin crust was quite soggy. 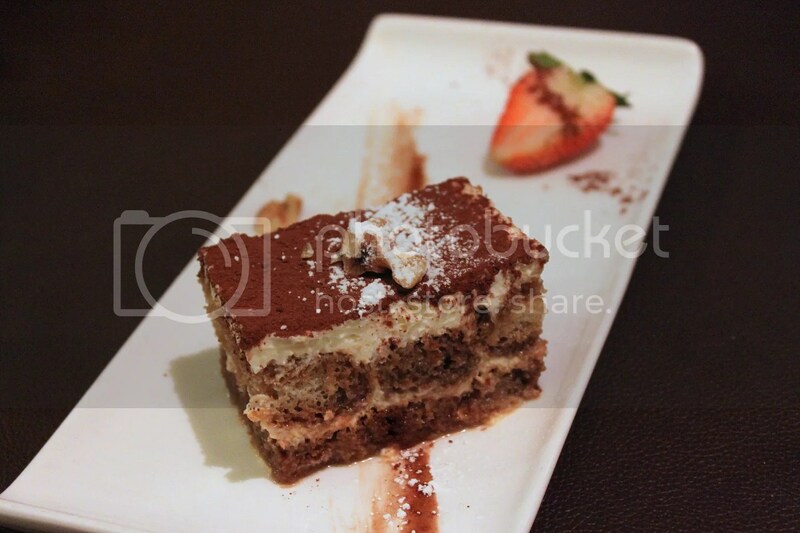 We ended with the award-winning Tiramisu. It’s hard to say if it’s worth the hype however as our individual opinions of it were incongruent. Some of my dining companions loved it while I thought it was meh. 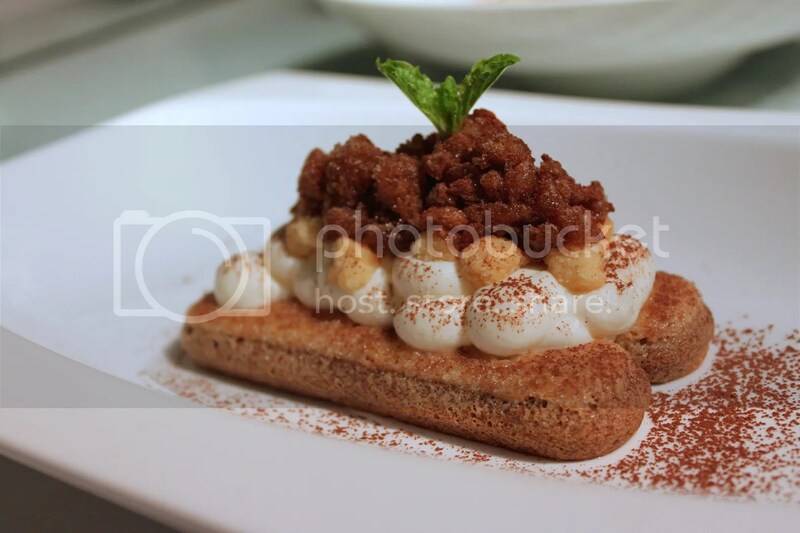 The main gripe I had was that the Ladyfingers biscuit, the spongy cake used within a Tiramisu, was overly soggy which dampened my spirits as well, pardon the pun. 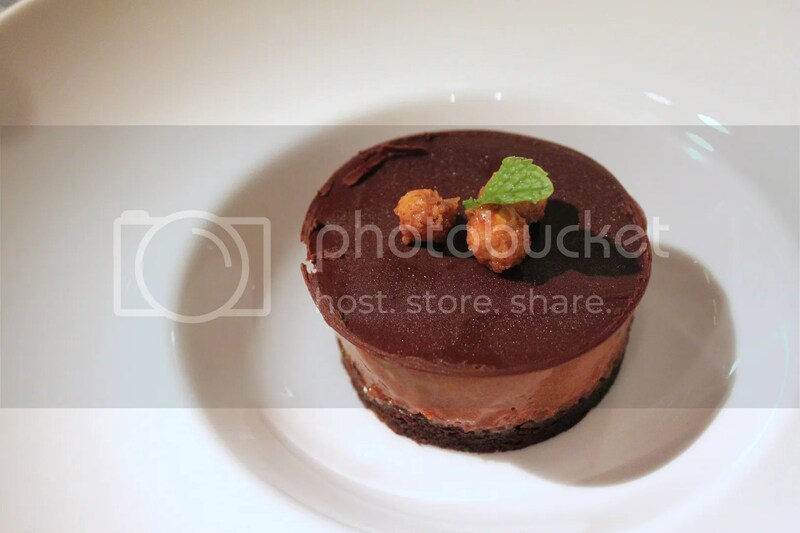 I don’t consider Amici to be anywhere near the best for Italian dining in Singapore. It’s an overpriced neighbourhood Italian joint, nothing more nothing less. 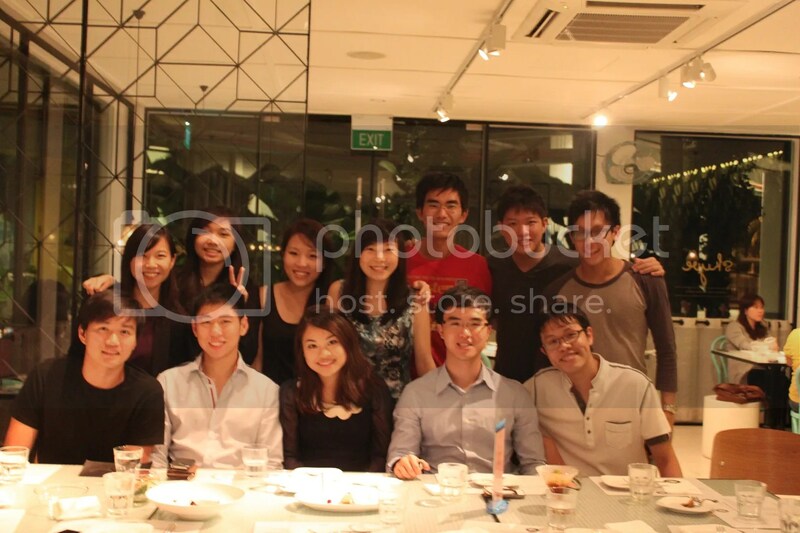 This meal was hosted and paid for by Amici. Kilo has been operating for 2 years now and yet still packs a full house on week nights. I still remember a year ago when I tried (twice) making a reservation 2 weeks in advance and got declined due to the place already being fully booked. Something was definitely going for them and I was curious to find out, especially since I was a fan of Raw Kitchen Bar (what Kilo was called before they shifted to the current premise). 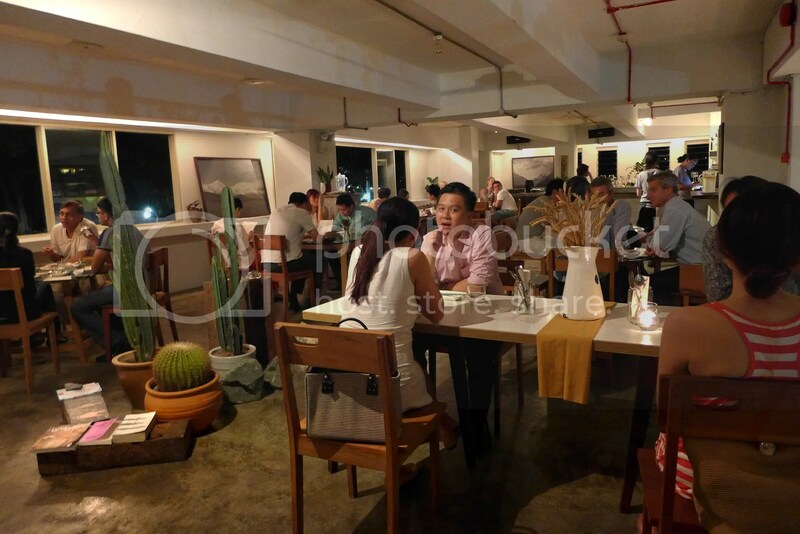 The setting of Kilo is of a casual cafe style and since there’s no air conditioning in the eatery, be prepared to sweat a bit if you are coming in formal work attire on a warm night. We had the Seared Scallops served on White Wine Mushrooms topped with Sweet Mushroom Reduction + Momotoro Tomatoes ($23++) for appetizers. 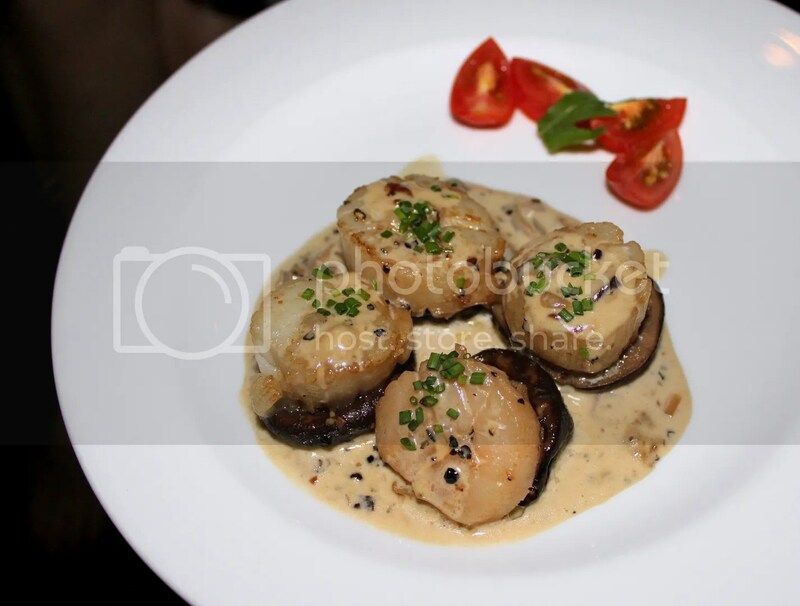 I just love scallops but the highlight of this dish would actually be the robust mushroom cream sauce. If only there was a piece of bread to wipe the plate clean. 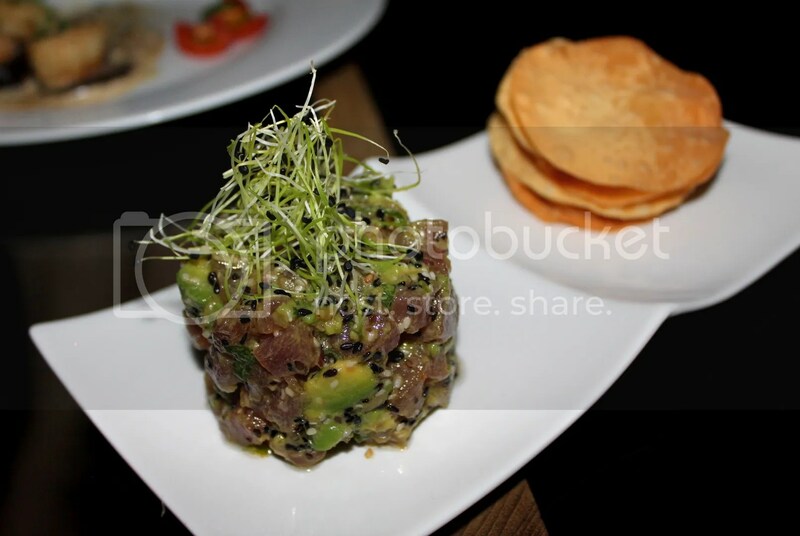 Our favourite for the night was the Sesame-Avocado-Wasabi Flavoured Tuna Tatare + Flourchips ($22++). I’m not a fan of tuna sashimi but the ones here feels slightly fattier and doesn’t taste as bloody and as what one might get at a Japanese restaurant. The gentle hint of wasabi was refreshing and the creaminess of the avaocado probably helped to tone down the spice to an optimal level. While it’s one of their signatures and the better of the two mains we ordered, I wasn’t thoroughly impressed by the Day-night 12 hour Pork Belly with Purple Potato Wedges, Sour Cream & Crackling ($29++). The pork belly wasn’t as tender as I had anticipated and some parts of the crackling were so tough that one might risk breaking a tooth or two. 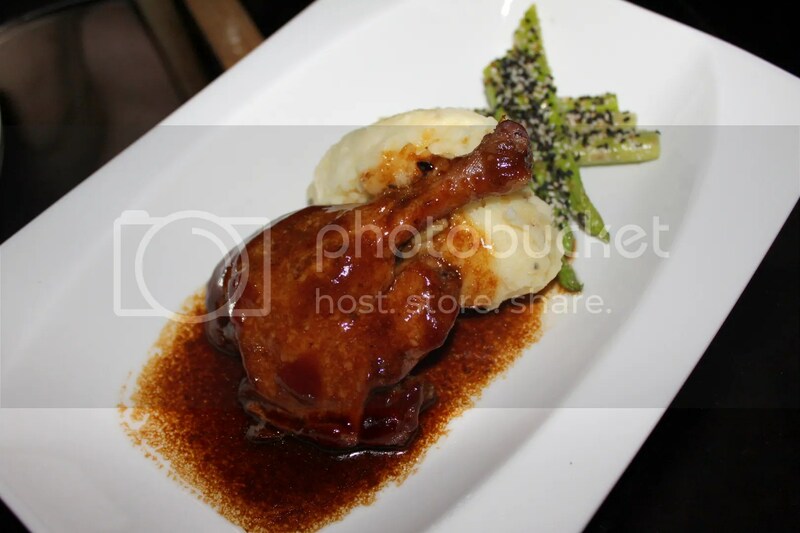 Balsamic Duck Leg with Butter Parsnip Mash & Sesame Asparagus ($30++). On a spectrum, the mash would be closer to the coarse and chunky side. A bit too dry and not buttery enough for my liking. 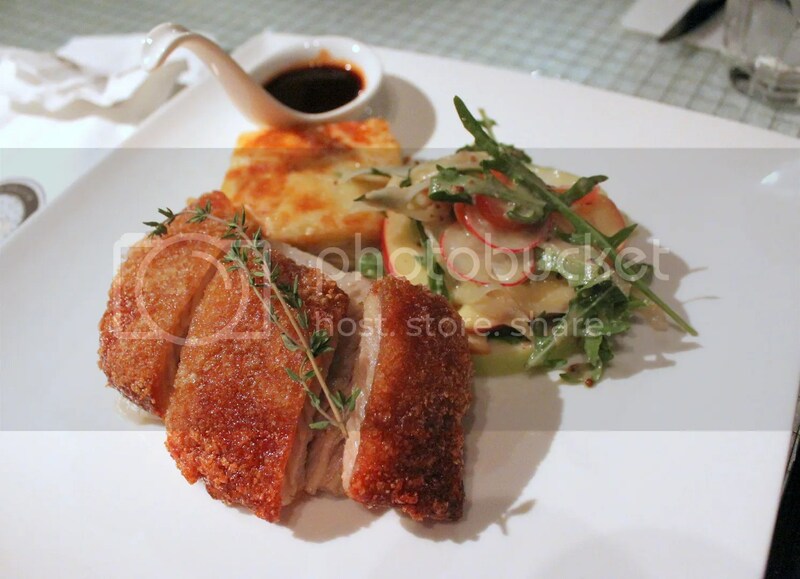 The texture of the duck wasn’t bad but given that the sauce tasted somewhat similar to the one from the pork belly, we got bored of it quickly. Truth be told, Raw’s Lava Cake with Vanilla Ice Cream ($15++) was really disappointing, possibly the most overcooked lava cake I have had at a restaurant. There was no lava whatsoever, so it was more of a chocolate muffin. The Ice Creams here are made in house and it was decent. I have attempted (or more like my friends attempted and I watched) making lava cakes at home so I could tell they screwed this one up real badly. Had a bottle of their Gewurztraminer (a type of White Wine). Alongside Rieslings, it’s probably one of the easier wines to drink given its high sugar content. 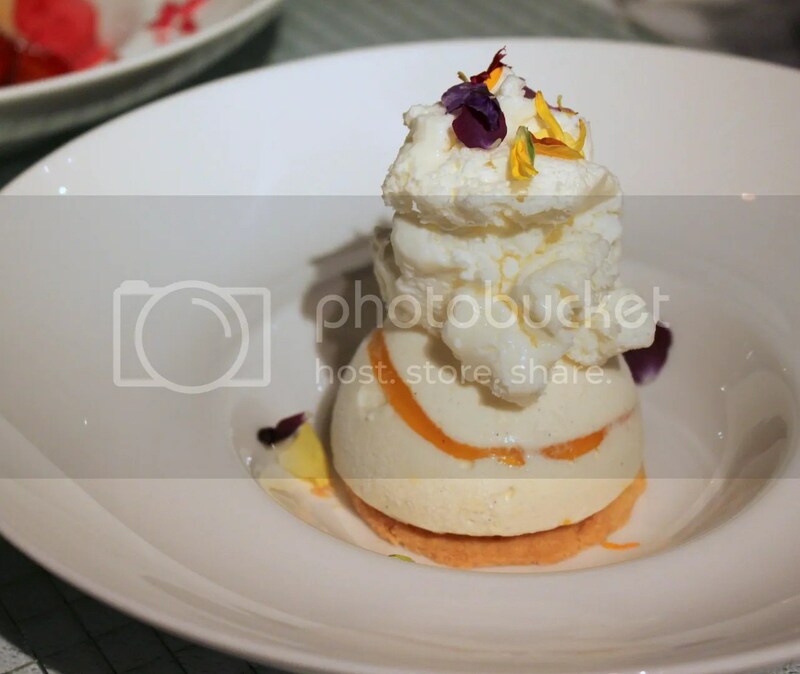 Left the place feeling slightly perplexed as the experience was short of the dinner I had at Raw Kitchen Bar. However, given all the rave reviews I have read online about Kilo and constant stream of customers, I think a reassessment is in order. Categories : All YumYums in my TumTum, Cuisine Type YumYums, Fusion, Italian, Japanese, Lavender / Kallang, Location of YumYum, Western, Yummy!